Contains the powerful antioxidant compound called Resveratrol sourced from the Japanese Knotweed plant. Resveratrol’s anti-carcinogenic and anti-inflammatory properties have been well studied and believed to not only aid in the prevention of chronic diseases such as Cancer and Alzheimers, but also play a significant role in the treatment of these diseases and others as well. Studies have shown that Resveratrol aids in stopping tumor growth, while keeping the disease local and preventing it from spreading. Unfortunately, cancer in dogs is higher than it’s ever been. The numbers are very scary. Dog owners desperately need help with this terrible disease that is affecting more of our best friends than ever before. Studies involving very different groups of animals prove that resveratrol supplements for dogs is the only compound that continuously promotes and reinforces good health within all the different groups of animals for those with disease, illness and supplementing just for maintenance. Research also shows that the main ingredient in Resvantage called resveratrol supplements for dogs can reduce old dog tumors occurrence. It’s important to understand that Resvantage includes many ingredients that target disease with resveratrol being the main ingredient. 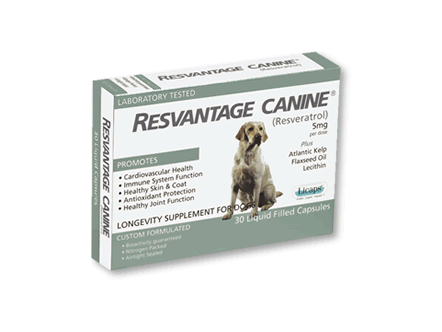 For dogs with cancer, the main ingredient in Resvantage (resveratrol) is believed to help keep the disease local and stop the spread of the disease. 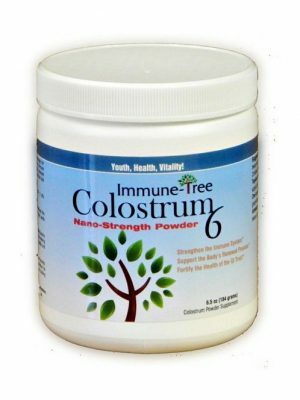 Keep in mind that there are several key ingredients in this formula that make it so effective. DOSAGE FOR DOGS WITH CANCER: DOUBLE THE DOSE AND FOR DOGS OVER 50 POUNDS, GIVE THE EQUINE VERSION INSTEAD (not the canine version) SINCE IT IS MUCH MORE COST EFFECTIVE. Great efforts have been made to protect Resvantage against oxygen by encapsulating in an environment that is oxygen free and nitrogen rich in order to maintain maximum potency in each capsule. Resveratrol supplements for dogs is known as a polyphenol called phytoalexin which is best defined as a plant’s defense system that fights off disease, resveratrol for anxiety also. Studies show that resveratrol for dogs has been shown to encourage cellular health in animals by maintaining cell development. Resveratrol supplements for dogs is an antioxidant, and evidence shows that it also supports an healthy inflammation response. 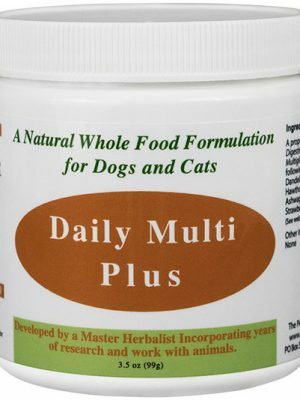 Supports a long life and protects from diseases common in older pets. It also helps to maintain healthy blood sugar levels in the body and the breakdown of food into energy. May reduce old dog tumors occurrence and spreading. Sea Kelp is naturally high in iodine which is beneficial for thyroid and glandular support. 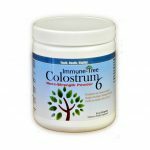 High in vitamins, trace minerals and amino acids which all play a vital role in nutritional support. Omega 3 fatty acids are good fats which are fundamental to neuromuscular development, skin and coat health, healthy inflammation response, disease support, and many other healthy functions. Helps to support the brain and nervous system. Lecithin also emulsifies and helps with the digestion of fat while encouraging a strong metabolic process by breaking down food into energy. If giving more than one capsule daily, divide between AM and PM and for optimal absorption, administer during or after the animal has eaten. Give dogs 1 capsule for every 30 lbs. of weight daily. **Note: For dogs diagnosed with cancer and over 30 pounds, it can be more economical to use the resvantage equine formula instead. Is resveratrol safe for dogs? Do not give to puppies less than 6 months old. Do not give to nursing or pregnant dogs, or those dogs who will be bred. If your dog has an iodine sensitivity, do not use. Response to supplements varies by individual. If your pet exhibits any symptoms that concern you, discontinue use and contact your veterinarian.